Wet? Hot? How about both? July in Hong Kong sees plenty of rain and plenty more humidity (not to mention the pickup of typhoon season), but that's never stopped Hong Kong locals from celebrating a few key festivals during this time. Hong Kong has many events going on (mostly indoors) to keep you occupied and dry in July. Expect humidity and temperature at their worst throughout July in Hong Kong, with regular monsoon downfalls. 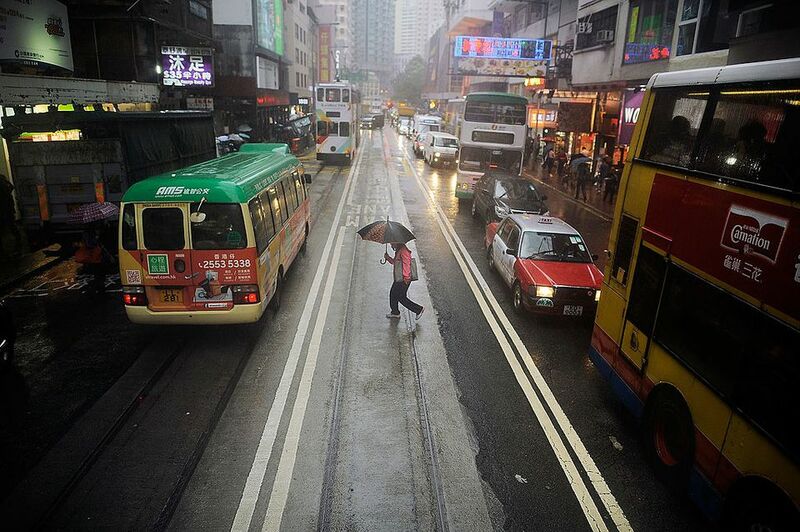 Typhoons in Hong Kong are occasionally seen in July, bringing high winds and plenty of rain. Due to the summer break taking place around this time, the crowds around Hong Kong may actually be larger than through the rest of the year. The sea in July on average reaches a very pleasant 80 degrees Fahrenheit, making it the ideal time to visit Hong Kong's many beautiful beaches. Pack your bags with light clothing and rain protection gear to prepare for Hong Kong in July, where both sun and rain will be out in force. An umbrella serves double duty in Hong Kong. It can be used both for the frequent downpours, but also to deflect the intense sun; locals use umbrellas even in bright weather for this purpose. If outdoors for more than 20 minutes, consider sun lotion, a cap or other sun protection measures. A light sweater is useful, as many areas in Hong Kong are air-conditioned; the refrigerator-like air in such places will require added protection. First-time visitors should be wary of the humidity, which will leave you soaked in sweat after 10 minutes of walking. Be sure to take on plenty of liquids to battle against dehydration. And, if traveling to the countryside, bring mosquito repellent to keep the bugs away. Beyond the sand and sea and closer to the city center, though, Hong Kong's events calendar also gives July visitors plenty to do. Ocean Park Hong Kong: Its annual Summer Splash runs through July and August, offering a beach experience to all paying customers within the park grounds. HK SAR Day: July 1 is Hong Kong's official foundation day, a public holiday with patriotic events like cultural performances, parades, and flag-raising ceremonies. Chinese Opera Festival: Visitors arriving in July will find themselves right in the middle of Hong Kong's Chinese Opera Festival, which runs from June to August. Local enthusiasts of Chinese Cantonese opera stage daily performances in publicly-accessible areas like the Tsim Sha Tsui Promenade, the Hong Kong City Hall, and the Space Museum. International Arts Carnival: This carnival also takes place through Hong Kong's summer months, serving up puppetry, dance, magic, theater and more for the junior set. Lan Kwai Fong Beer And Music Fest: As one of Hong Kong's biggest outdoor parties, this festival showcases the world's best beers along the streets of Lan Kwai Fong, with over 60 booths serving up the bubbly. HKTDC Hong Kong Book Fair: This book fair aggregates more than 600 exhibitors from all over the world, catering to book lovers looking for rare and new volumes, and some out-of-this-world bargains. The 2019 Book Fair takes place at the Hong Kong Convention and Exhibition Centre from July 17 to 23.